Flemish painter and draughtsman, active also in Italy. Before becoming master of the Antwerp Guild of St Luke in 1632, van Lint worked for several years with Artus Wolffort; he recorded their collaboration in his diary. 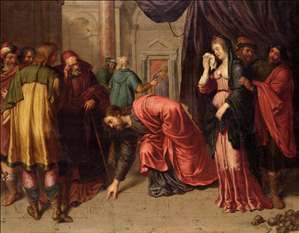 During these years he frequently copied the more famous paintings in Antwerp s churches, not only those by Peter Paul Rubens, but also works by older masters such as Marten de Vos and the Francken brothers. 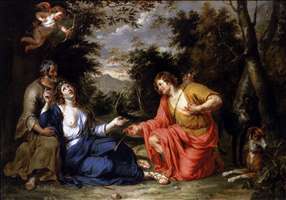 His earliest known painting, an Adoration of the Shepherds (1632; Vienna, Salesianerinnenkirche), shows a clear indebtedness to Wolffort s style, which was in the pre-Rubensian, academic manner of Otto van Veen. See more details about "Christ and fhe Adulterous Woman"
See more details about "Silvio and Dorinda"